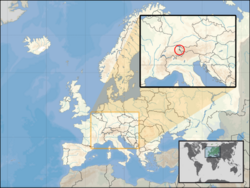 The Principality of Liechtenstein (German: Fürstentum Liechtenstein) is a small, doubly landlocked country in Central Europe, bordered by Switzerland to its west and by Austria to its east. Mountainous, it is a winter sports resort, though it is perhaps best-known as a tax haven. Despite this, it is not heavily urbanized (like the Principality of Monaco or Gibraltar). Many cultivated fields and little farms characterize its landscape both in the north (Unterland) and in the south (Oberland). It is the smallest German-speaking country in the world and is the last remnant of the Holy Roman Empire. 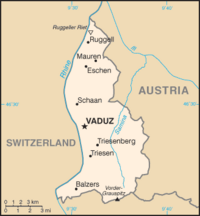 Its capital city is Vaduz. This page was last modified on 1 September 2009, at 13:58.